At the Y, we know that one size doesn’t fit all. That goes for Y memberships too. Everyone is welcome at the Y. To help meet the varying needs of our members and our community, we offer several categories of membership at our four branches. For additional membership information, to schedule a tour, or to join the Y, call or stop by one of our YMCA of Metropolitan Milwaukee branches. We’re open 7 days a week. We strive to keep the Y accessible to all, that why households with an annual income of less than $75,000 are eligible for reduced membership pricing! 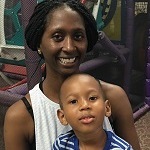 The Y helps me maintain a healthy lifestyle while being a single mother. I’m able to participate in a variety of exercise programs, knowing my child is being watched by passionate, trustworthy staff members. By utilizing the many resources offered by the Y, I’ve transformed my life and outlook. I lost over 120 lbs and I couldn’t have done it without the support of the Y.